Luxury Experience Magazine met Chef Emmanuel Renaut owner of Flocons de Sel in Megève, France, rated with two Michelin stars and a 17 GaultMillau rating at the 15th St. Moritz Gourmet Festival in Switzerland in January 2008 where he was one of the featured chefs. I had the pleasure of meeting with Chef Emmanuel Renaut several times over the course of the six-day festival, as well as sampling his delicious cuisine. Meeting with him in the kitchen of the Rôtisserie des Chevaliers at the Kulm Hotel St. Moritz where he was the guest chef, I learned that he is passionate about cooking, and when not in working in the kitchen of his own restaurant, he can be found traveling the world teaching students traditional French cuisine. His passion also extends to skiing and climbing mountains, and when he travels to Japan, one of his favorite places in the world, he usually makes time in his schedule to climb Mt. Fuji if time and weather permit. 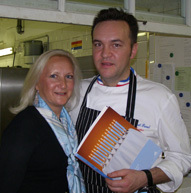 Chef Emmanuel Renaut graciously shares his recipes for a 2-course menu to give you a taste of France. Method: Mix the pike, salt, sugar, cream, Armagnac, and hot melted butter together, let rest for 2 minutes to heat through. Pass mixture through a sieve. Method for the sauce: Reduce the vegetable bouillon by half to infuse the hibiscus and butter, and then correct seasonings. Put the pike mixture in a mold and steam for 15 minutes at 80° C (175° F) and then cool. Cut the bread and the steamed pike into rectangles of the same size. Place the pike on the bread, and the toast with clarified butter in a warm oven at 90° C (195° F). Serve the toast with the sauce. Method for the crayfish: Clean, and remove the central bowel, and then cook in boiling water for 1 minute. Refresh in ice water. Peel the tails and remove the pincers. Chill until cold. Method for the gelée made from the carcasses: In a pan, sear the carcasses with olive oil, add the bouquet garni, and then deglaze the pan with Noilly Pratt and 30 cl water. Simmer gently for 1 hour. 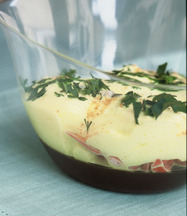 Season to taste with salt and pepper and pass through a chinoise reserving 20 cl liquid to soften the sheet of gelatin. Portion the mixture into 4 glases and chill until cold. Method for the corn emulsion: Cook the ears of corn in milk. Drain the corn, then scrape off the kernels off the cob, mix and then pass through a sieve. Let cool and then add the cream. Season to taste. Serving time presentation: Sauté the craysih in a non-adhesive frying pan to warm, then place them on the gelée and cover with the corn emulsion (beat and use only the top portion or place in a whipped cream siphon to add more volume). Garnish with minced coriander and some grains of salt. For information on Switzerland, please visit the website: www.MySwitzerland.com. For information on St. Moritz, please visit the websites: www.StMoritz.ch and www.Engadine.StMoritz.ch. For information on the St. Moritz Gourmet Festival and all of its events, please visit the website: www.StMoritz-GourmetFestival.ch. For information on the Cartier World Cup Polo on Snow, please visit the website: www.PoloStMoritz.com. © April 2008. Luxury Experience. www.LuxuryExperience.com rights reserved.